As we approach that “great and dreadful day” (Mal. 4:5; D&C 2:1; 110:14, 16) when all nations will see the Lord’s salvation and Abraham at the Lord’s right hand, the world seems to become more and more like Abraham’s. As his world was as wicked as Noah’s, so shall be ours: “As it was in the days of Noah, so it shall be also at the coming of the Son of Man” (JS – M 1:41). And as Abraham’s world becomes ours, his life is not just history but a guide, as it has always been for those aspiring to be the people of God. Isaiah’s words are more relevant than ever: “Look to Abraham your father” (NRSV Isa. 51:2). What do we see when we look to Abraham? We see first a boy in an incredibly wicked world from which Zion had long since fled, a boy who refuses to go along with the evil practices but prayerfully seeks his Creator in purity and humility. And what that root found in streams which, fed by the snows and seaming the sides of Lebanon, hottest summers never dried and coldest winters never froze, the unequaled faith of Abraham found in close and constant communion with God. Like Enoch, he walked with God. Each important transaction of life was entered on in a pious spirit and hallowed by religious exercises. His tent was a moving temple; his household was a pilgrim church. Wherever he rested, whether by the venerable oak of Mamre, or on the olive slopes of Hebron, or on the lofty, forest-crowned ridge of Bethel, an altar rose, and his prayers went up with its smoke to heaven. He lived on terms of fellowship with God such had not been seen since the days of Eden. Voices addressed him from the skies, angels paid visits to his tent, and visions of celestial glory hallowed his lowly couch and mingled with his nightly dreams. He was a man of prayer, and therefore he was a man of power. 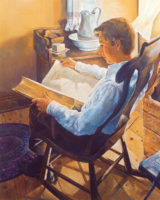 Nourished by the Almighty – whose commandments he kept, whose ordinances and priesthood he received, whose scriptures he searched, whose gospel he preached, whose love he shared, whose Zion he built, and of whose Beloved Son he testified – Abraham was not only blessed by God but also chosen, along with his posterity, to be instruments in carrying those same blessings to all mankind, the blessings of Zion. Zion is what Abraham sought, what he built, and what he qualified for, as Zion above actually partnered with him to protect him, bless him, teach him, empower him, and help in his mission. As we look to Abraham, we also see him constantly seeking Zion’s King, the Savior, through righteousness, prayer, and faith, even as he invites all to Christ and Zion by unwearying missionary labor and abundant kindness and hospitality. We see Abraham living the laws of obedience, sacrifice, the gospel, chastity, and consecration, and constantly doing temple work. “To be sure,” wrote the poet Coleridge, “if ever man could, without impropriety, be called, or supposed to be, ‘the friend of God,’ Abraham was that man.” 13 We see, in other words, the epitome of friendship and the pure love of Christ. No wonder the Lord “revealed unto him,” stated John Taylor, “some of the greatest and most sublime truths that ever were made known to man,” 14 and gave him, added Orson Hyde, some of the most sublime “promises that no other man has obtained . the Son of God excepted.” 15 In short, we see in Abraham’s life a remarkable fellowship with the Almighty and a powerful pattern for obtaining the blessings of Zion. And who are the Latter-day Saints? Like their founding prophet Joseph Smith, they also are seed of the great Patriarch, as the Lord has declared: “ye are the children of Israel, and of the seed of Abraham” (D&C 103:17). They in turn are called to go gather out their fellow Abrahamic descendants. 1Testament of Isaac 2:27-28, in Charlesworth, Old Testament Pseudepigrapha, 1:906. 2Commenting on the statement that Abraham gave the residual property all to Isaac, the Zohar states that Abraham bequeathed to Isaac “the holy heritage of faith to which Abraham clave.” Zohar, Vayera 100b, in Sperling and Simon, Zohar, 1:325. 3Kasher, Encyclopedia of Biblical Interpretation, 3:37. 4Qur’an 2:132, in A. Ali, Al-Qur’an, 27. 5Qur’an 2:132, in Asad, Qur’an, 27. 6Schram, Stories within Stories, 299. 7Buxbaum, Life and Teachings of Hillel, 74-75. 8Kasher, Encyclopedia of Biblical Interpretation, 3:50, citing various sources. 9Another translation reads here: “For these things, I tell you, are of greater value than anything else I can bequeath to you.” Testament of Benjamin 10:4, in Sparks, Apocryphal Old Testament, 599. 10Testament of Benjamin 10:2-7, in Charlesworth, Old Testament Pseudepigrapha, 1:828. The tribe of Benjamin is not only the source of this statement and the Revelation of Stephen, but perhaps also the letter to the Hebrews (containing the passage telling that Abraham sought the heavenly city), which seems to have been written by someone who “doubtless came under the influence of the teaching of Stephen.” Paul – who Clement thought may have written the original version (in Hebrew) of the letter, and who Origen thought was the author of the letter’s thoughts, although the letter itself was written by someone else – was of course present at Stephen’s martyrdom (Acts 7:58), and was also of the tribe of Benjamin (Philip. 3:5; Rom. 11:1). Guthrie and Motyer, Eerdmans Bible Commentary, 1191. On Abraham’s teaching his posterity to keep the law of the Lord, see also Genesis 18:17-19. 11Mawadudi, Towards Understanding the Qur’an, 111. 12Noble, Great Men of God, 65-67. I have taken the liberty of breaking up Noble’s wonderful lengthy passage into paragraphs that are not in the original. I hope he will pardon me. 13Coleridge, “Table Talk,” May 16, 1830, in Goldman, In the Beginning, 539-40. 16Clement, The First Epistle of Clement to the Corinthians 31, in Ante-Nicene Fathers, 1:13. 18Ibid . , 11:152, echoing the Savior’s statement to His Jewish contemporaries that “if ye were Abraham’s children, ye would do the works of Abraham.” John 8:39. 19Harris, Commentary on the Pearl of Great Price, 231. 20Nibley, Abraham in Egypt, 651-52. 21Ginsburg, Essenes, 122 (in The Kabbalah ); and see generally Chavel, Encyclopedia of Torah Thoughts, 42-26; Cohen and Mendes-Flohr, Contemporary Jewish Religious Thought, 299-302. 22Soloveitchik, Man of Faith, 68. 26Galbraith and Smith, Scriptural Teachings of the Prophet Joseph Smith, 350. 28Gordon B. Hinckley, “Reaching Down to Lift One Another,” Ensign, November 2001, 54. 29Gordon B. Hinckley, “Living in the Fulness of Times,” Ensign, November 2001, 6. 31Galbraith and Smith, Scriptural Teachings of the Prophet Joseph Smith, 170-71.